>> Can Collagen Help Remedy Weak or Sensitive Teeth? Weakening bone and gum leads to gum disease which often requires tooth extraction. 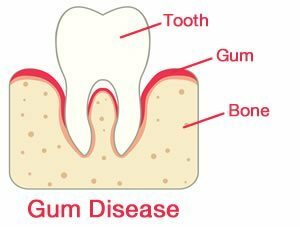 Gum disease is a chronic infection of the gums and the bones that support the teeth. What happens is the bacteria start accumulating around the teeth. They give off acids that start eroding the bony parts of the teeth. The immune system gets involved in the fight because the bacteria enrage the immune cells that want to fight them off. Soon it’s not just the bone that’s affected and weaker. It’s also the connective tissue that holds the teeth in the mouth. Without this support, the tooth starts to loosen and eventually falls out if nothing is done to remedy the situation. Sometimes the dentist will come in and say the teeth have to be removed. Loose tooth pockets are the first sign of bone loss. In fact, women with osteoporosis are three times more likely to experience tooth loss. There’s a part of the jawbone that supports the teeth called the alveolar process. This is the part of the bone that holds the tooth in its socket. When this alveolar bone starts dwindling, the teeth start moving in their socket which is when tooth loss happens. Nobody wants to lose their teeth, but once the problem gets this far along there aren’t many other options. And as we all get older, time is not on our side. Studies show that we lose collagen as we blow out birthday candles. I’m joking, but in all seriousness there’s a proven connection between aging and losing bone density and collagen in the body. Enough about the problem. Let’s get to the solution. If you boost up your collagen intake, especially with a collagen supplement, you’ll simultaneously improve the bone density in your jaw, in the papilla around the teeth, in the alveolar bone – and possibly be able to keep your teeth. But you can’t forget the vitamin C, along with the amino acids proline and lysine. All these are absolutely essential for the formation of healthy collagen. In fact, many vitamins and minerals act as catalysts to support the manufacture of proteins. But in the case of collagen, vitamin C is actually used up in nearly every step in the formation of collagen and its precursors. It’s one of the most essential nutrients for collagen, which is why a serious lack of vitamin C leads to scurvy. Now think about this for a minute – do you get enough vitamin C in your diet? Are you taking a supplement or eating enough vitamin C rich citrus fruits? This has to be daily, not just every now and then. When most people get diagnosed with brittle bones (osteoporosis) most people think that the only thing they need is more calcium. This is a mistake. 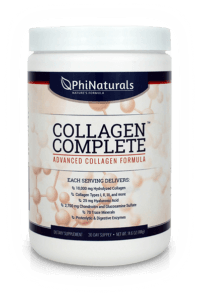 Collagen peptides – These are the major building blocks for new bone. Hydrolyzed collagen supplementation has proven to stimulate osteocytes (cells which create new bone). It is also proven to also improve symptoms of osteoporosis in the worst cases. Collagen also helps improve the lining of the intestines, so they necessary to absorb calcium from intestines. Vitamin C – Assists in the formation of collagen, cartilage and bone, and supports the initial structure so minerals may be deposited to build bone. Enhances vitamin D’s bone effects. Protects collagen from anti-oxidants which cause collagen to weaken as we age. Vitamin D – Helps you absorb the calcium and phosphorus. Vitamin K – Important for the bone protein matrix that calcium crystallizes and osteocalciun synthesis (provides the structure for bone). Phosphorus – Helps you absorb the calcium. Regulates the production of protein. Involved in hormone signaling and pH buffering to keep acid-alkaline balance in the normal range. Boron – Important for the production of estrogen in the body, which helps increase bone density. Necessary for absorption of calcium, magnesium and vitamin D.
Magnesium – Works with the thyroid to produce calcitonin that preserves the bone, and the parathyroid that regulates the breakdown of bone. This mineral is stored in the bone. Vitamin A – Important for new bone cells to develop. Deficiency causes less calcium to be absorbed. Vitamin B6 – Helps stimulate hydrochloric acid in the stomach so you can absorb the calcium in your diet. Strengthens bones, too with cross-linking of the collagen fibers. Folic acid – Important to metabolize homocysteine; when homocysteine levels are normal, there’s less chance to develop osteoporosis. Vitamin B12 – When deficient, there’s a greater chance of having osteoporosis. Silica – Spares the amount of calcium you need. Strengthens bone by cross-linking collagen fibers. Combines with calcium to build bones that are strong and flexible. Zinc – Forms the meshy matrix that starts the whole process of bone building which then attracts calcium and phosphorus. Involved in the process of calcium absorption in the body. Manganese – Important for cartilage and collagen formation, plus bone mineralization. Copper – Important for the formation of bone (and its strength) and connective tissue plus involved in cross-linking of collagen fibers. Potassium – Prevents loss of calcium in the urine. Chromium – Promotes the synthesis of collagen from osteoblasts, cells that build bone. Also regulates the breakdown of bone. Adequate chromium in the body lowers the excretion of calcium in the urine. Strontium – Adds strength to the bones. Breaks down the old worn-out bone cells so the new bone can be strong. Get in Touch with Us @ (888) 507-8958 for Collagen For Health Teeth.